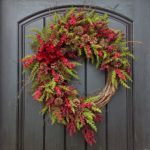 Have you thought of hanging a Christmas swag on your front door this season? 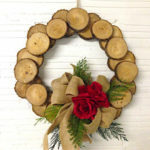 Christmas wreath is the automatic choice for many of us when it comes to decorating our front door and mantel. Well, how about a Christmas swag instead? 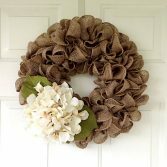 Making a swag is less complicated than making a wreath, and you’ll have all the supplies available given that fall is not over yet. 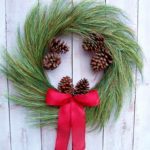 We’ve provided you a video tutorial to see how to make a pretty basic Christmas door swag with greens and a piece of ribbon! With fresh greens, embellishments, florist’s wire, and a piece of ribbon, you can create your own Christmas swag in less than an hour. 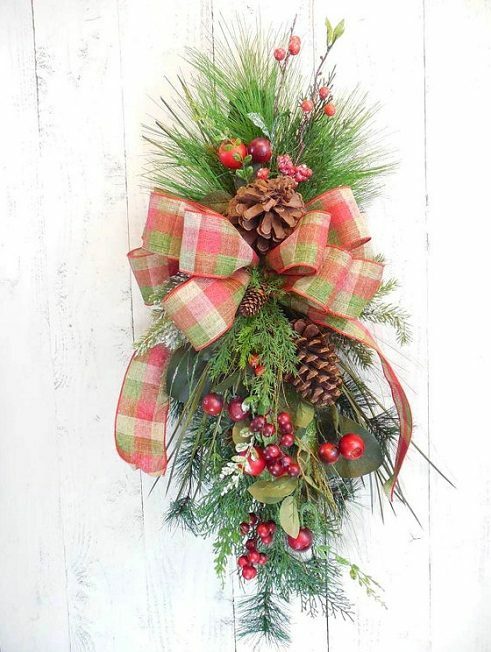 You can even use artificial or real evergreen branches to make this easy swag for your door. 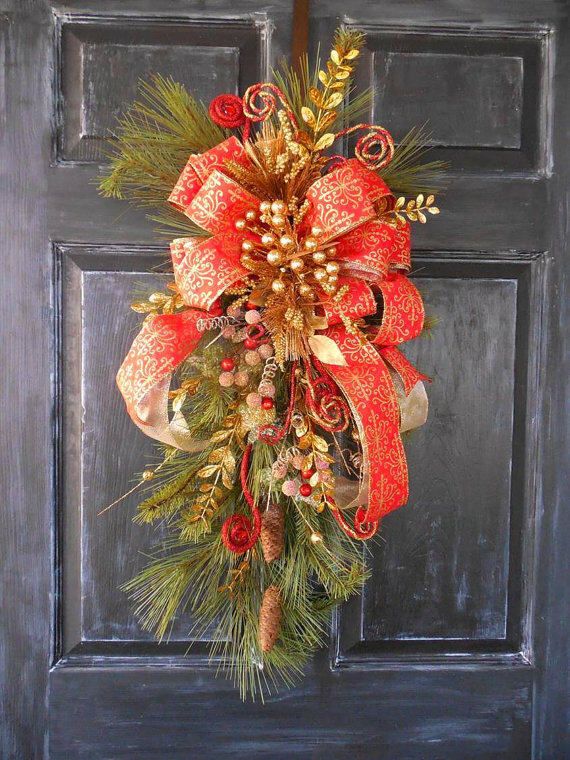 A Christmas swag adds a festive touch to your front door! Link to Christmas Swag video. Push both sides of the hanger to the center so that it takes an oblong shape. Give the hanger’s hook a circle shape with a pair of pliers to use it as a hanger. Select a piece of fir branch that has a solid center. Pick one that is approximately 18-inch long. A teardrop shape, with a rounded top end and narrow tapered bottom end, will work better. It will be the base of the swag. Add two additional pieces of fir branches of approximately 14-16 inches to fill in the gaps of your base. Similarly, arrange three branches of about 10-12 inches, but the top ends pointing in the opposite way. Attach the branches together by twisting the floral wire around the point where their top ends meet each other. Place the bundle of fir branches on top of the hanger. Secure them by wrapping the wire around the entire hanger. Place layers of Blue Cone Cedar, Oregonia, and Eucalyptus one by one following steps 2, 3, and 4 (three branches to the direction of the base fir branch and three others towards opposite direction) or any way you like. Attach each extra layer to the hanger with floral wire. Add a couple of different sized pinecones, with smaller ones toward the top and larger ones sinking toward the bottom. Add two or three small silver bells in between the pinecones. Make a long-tailed bow with a piece of red-colored ribbon. Attach it near the top end of the swag. Set the tails at the each side of the swag with floral wire pieces. Different types of greens will provide texture and fragrance while the vibrant red-colored burlap will add accent and make the swag pop. 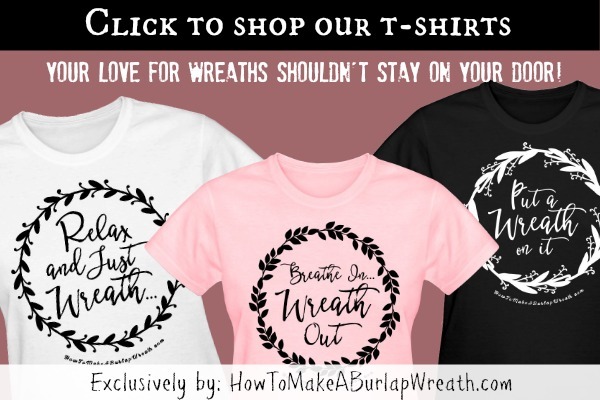 Wreaths, swags, garlands, and other decorations are thoughtful details that create a festive and joyful atmosphere indoors and out during the holidays. 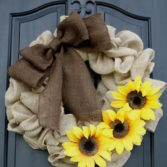 This HGTV article shows how to switch the festival mood on by decorating the indoors with innovative ideas. Christmas swags and garlands are not just for decorating the front doors. 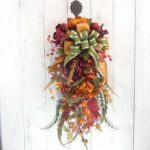 Better Homes and Garden presents more than 50 ideas for how to decorate your interiors by incorporating beautiful garlands and swags into everywhere – from mantels and windows to dining chairs and chandeliers. 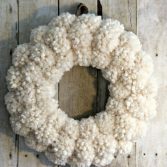 For more Christmas wreath ideas visit our Christmas wreath category, here. « Holiday Gifts Guide #Giveaway – Week 2! Very pretty! Thanks for sharing the steps to make my own. Thanks for sharing the ideas, you can make your door look more attractive by matte finished color on it.